So let us start our focus on Millwood first. I think I am going to start structuring this recap like how I did for Saving Hope, which is divide them out according to characters. She is super pissed that David got off scot free over taking advantage of her and she is out for blood. Gerilyn tells Owen that she plans on suing David for criminal misconduct when she was a minor. Owen thinks that Gerilyn should reconsider as lawsuits can be costly. We later see Gerilyn talk to a real estate agent, who also happens to be a former victim of David, to help sell her house so she can use the money to pay for a lawyer. While the real estate agent sympathizes, she advises Gerilyn not to sell. So Gerilyn eventually turns to Billy to be her lawyer. At first, Gerilyn didn’t want to ask Billy as she felt he was a bit close to the case. However, Gerliyn does go to Billy and begins to recount her first encounter with David Hanley. Shane brings Billy his morning cup of coffee that turns out to be beer. The reason being is Shane has a plan to revitalize Millwood and that is to open up a microbrewery. Shane presents Billy his handwritten business plan that includes the brewery floor plan on a napkin. Billy looks it over and thinks it is a good idea but wants Shane to hold off on meeting investors until it is more solid. Unfortunately, Shane has already lined up a potential investor to meet later that day and convinces Billy to go. So Billy comes up with a partnership agreement between the two brothers where Shane can keep the IP and Billy with offer up some money as start up costs. We then notice something off about Shane when we he thinks Billy has said something but he clearly didn’t. The two then head into town to meet the investors who seem to Billy has pot heads and not ideal. Shane wants Billy to give them the chance and the meeting seems to be going well. However, things turn south when all of them go to visit the potential property for the brewery. It seems the property manager was a no show so the investors pull out while insulting Millwood and Shane which prompts Billy to punch one of them in the mouth. Shane then reams his friend for being a no-show. We then see Shane talking back to the voices in his head and he runs to the potential brewery. Also of note, it is clear that Billy does not have a good relationship with his father. Molly and Luna call in Taylor to help them fix their TV and while there the friends discuss whether or not Taylor will read her father’s letter. Also, we see Luna and Molly drifting apart as Molly is not making any efforts in applying to any universities and Luna seems to be doubting whether it was a good idea to move in with Molly. Luna seems to have found purpose in volunteering with the Bear Clan and got energized when she went to orientation. Luna shares her excitement with Taylor instead of Molly. We definitely see the two ladies on different paths as Molly comes home the next morning clearly after a night of partying. And we do see Taylor read her dad’s letter with definite sadness. We open the episode with Noah visiting a colleague freaking out over everything. Noah tries to calm and tell him to still believe in the cause. When Noah thinks he has calmed him down, he leaves but we see this man end up just killing himself with a gun. Meanwhile, Joanna is freaked out over her car being hacked from the night before so goes to the police the next morning. But Joanna ends up leaving and not filing a report as she is afraid that it will make things worse. So, Joanna calls Billy to get him to contact a security contractor to help her. This contractor gets into contact with Joanna and gives her a burner phone as their method of communication. The contractor also tells Joanna to stay off social media and to give her car keys to her so she can trace the hack. And we of course and is confirmed that it is Lovand. Sunil has come up with a common name that connects Noah and Lovand: Jared Perenski. Unfortunately, Joanna’s potential witness happens to be the young man that had killed himself at the beginning of the episode. Joanna learns that Lovand was blackmailing him and making up false stuff about him that destroyed his life. Lovand’s lawyer comes to visit Joanna with an offer that if Noah takes down the app, they will drop the injunction, pay all legal costs and offer him a very lucrative job with Novatech. 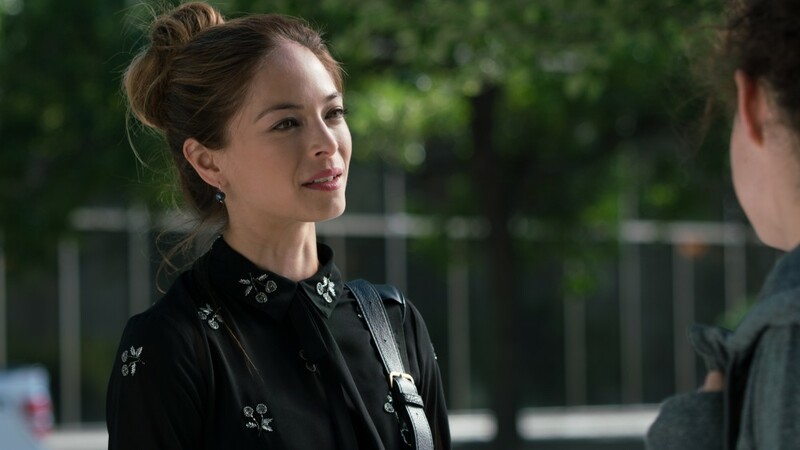 When Joanna presents the offer to Noah, he rejects and fires her saying he will represent himself at his contempt hearing. Noah ends up livestreaming his contempt hearing and also assaults a peace officer landing him in even more trouble. Teddy tells Joanna to get their client back. So at Noah’s hearing for assaulting the peace officer, he gets on the wrong side of the judge who is about to throw the book at Noah. Joanna comes into the court room with a copy of a blog post that the judge wrote admonishing the privilege of millennials and wants the judge to recuse himself because of his bias. This gets Noah out on bail with many conditions but this gets Joanna back on as his lawyer and she realizes Noah did all of that for publicity. As Joanna parts ways with Noah and his girlfriend, we see someone taking photos of her and we assume it the same one that has been following her for awhile.